No sewing room is complete without proper pressing equipment and investing in a professional iron can save valuable time and energy when constructing garments, home dec items, etc. While an iron is most important, always give careful consideration when choosing a proper ironing board or table. 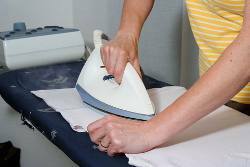 Dry irons are readily available, but steam irons are the most popular and versatile. Some have removable water reservoirs, but most non-commercial ones have convenient, built-in see-through reservoirs. Irons can weigh from 1 ½ to 7 lb. with the norm being 3-4 lb. Sole plates are either stainless steel, non-stick Teflon or aluminum and many have a space between the sole plate and main body to facilitate pressing around flat buttons. Choose an iron with many steam vents for more even pressing. Some models feature a very narrow tip for easier access in small spaces such as children’s wear or doll clothes. An iron with retractable feet allowing the iron to remain horizontal without touching the ironing surface when not in use is also available. For pressing small, gathered sleeves a “puff” iron is very convenient. It clamps to a table top, has two dry heat settings and an oval metal ball that heats quickly. This permits a completed sleeve cap to be shaped without distorting the gathers. A mini iron with a small heat surface similar to an arrow head and attached to a straight handle can be used for pressing small items and maneuvering in tiny areas. Serious sewers often prefer steam-generated irons. Non-commercial models consist of a larger separate water tank, the iron and a tube that connects the two. Since the water that generates steam is not located in the iron itself, no spitting occurs once the iron is thoroughly heated. However, the length of the tube may restrict pressing large items. Another model uses an internal heating and pump system in the iron itselt for professional results and no drips. The gravity-feed iron has a much longer tube and a water bottle that must be suspended at least three feet above the ironing surface. Water drips slowly into the hot iron, steam is produced then released by depressing a button on the handle. This also eliminates spitting and produces heavy steam favored by tailors for a perfect press. Granulated filter material must be added to the water but lasts a long time before it needs to be replaced. Always check the owner’s manual to determine whether your iron requires distilled, filtered or tap water. A table-top press is a plus in any sewing room. It produces sharp creases in pleats and trousers, presses larger areas with ease and adheres fusibles quickly and firmly. For limited sewing spaces, consider a door- or wall-mounted ironing board. These can be folded and hidden away. Since the narrow end of boards vary in width, the amount and type of sewing and pressing should determine your choice. Wider ends are excellent when working on men’s clothing, especially shirts. All board tops should be smooth metal open grids padded with either cotton or wool. These fibers allow moisture to wick away when steam-pressing. Ready-made covers are available for all models, but can be easily custom-sewn for a perfect fit. Choose cotton, linen, muslin or duck as opposed to silicone. This material reflects heat and steam back through to the iron often resulting in a less-than-perfect press. Steam pressing relaxes fibers so they can be rearranged with heat into the desired configuration. Silicone surfaces are often slippery making this more difficult.